Using this equation, we can calculate the value for each position on our final image, g[m,n]. For example, due to the periodic extension of the images, when circular convolution is applied we will observe a wrap-around effect. 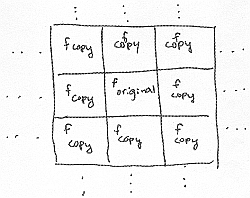 Where the last three terms in Equation 11 are a result of the wrap-around effect caused by the presence of the images copies located all around it. 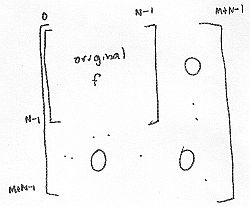 If the support of h is MxM and f is NxN, then we zero pad f and h to M+N−1 x M+N−1 (see Figure 3). where now we take the 1D FFT of each column, which means that if we have N columns, then it requires NlogN operations per column. Therefore the overall complexity of a 2D FFT is O(N2logN) where N2 equals the number of pixels in the image.